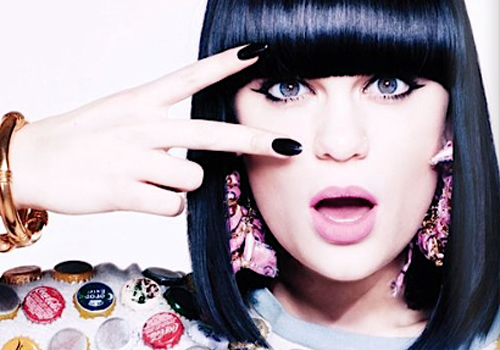 Jessie J adopts the electro-pop sound for her 2nd US single entitled ‘Domino’. The funky single is not exactly her usual type of material, but with a gorgeous rippling voice like hers she can more or less try anything and make it sound GOOD. The track is far from original, yet it still has massive potential of becoming her next big hit in the US with the single boasting an infectious guitar riff, melodious vocals and a compelling hook. After hearing that Jessie J will be performing ‘Domino’ live on Katy Perry’s ‘California Dreams’ tour, I later noticed how the ‘Firework’ singer’s style of music could have been influential during the song’s production stage; and to add to this, J’s single was produced by Dr. Luke who also produced Perry’s ‘I Kissed A Girl’ and ‘Hot ‘n’ Cold’…so you can unsurprisingly recognise the comparisons! Katy Perry’s latest video for her single ‘E.T.’ featuring Kanye West finally lands on earth for all to be amazed – her fourth No. 1 single on Billboard Hot 100 off of her Teenage Dream album. I imagined that this Floria Sigismondi-directed video was going to be epic after hearing the excellently-produced track, and gladly, it didn’t disappoint. The singer created her very own mini E.T. movie that perfectly reflected the lyrics of the song. Although I could sense what the visual was going to be like and the effects it would entail after checking out the video stills, this didn’t reduce the impact it had from my first official viewing – the graphics and fantasy-like imagery were just as captivating as I expected it would be, only more of course!